As Europe struggles to receive and integrate the massive influx of asylum seekers and migrants that began in mid-2015, the continent seems to once again be divided between East and West. The countries of East Central Europe argued vehemently against plans to relocate asylum seekers across the European Union (EU)—a proposal that was backed by Germany and other Western European countries. In September 2015, the Visegrád Group (composed of Poland, the Czech Republic, Hungary, and Slovakia) released a joint statement saying “any [EU] proposal leading to [the] introduction of mandatory and permanent quota for solidarity measures would be unacceptable." After weeks of railing against a proposed EU quota plan that would have seen 7,000 asylum seekers resettled in Poland of the 160,000 allocated across the European Union, the country’s government, led by Civic Platform Prime Minister Ewa Kopacz, voted in September 2015 to accept it. In caving to European pressure, Poland was criticized by its fellow Visegrád Group members, who together with Romania all voted against the plan. Poland’s alignment with the European consensus did not last long, however. In the October 2015 parliamentary election, the right-wing Law and Justice Party won the majority of seats, and official rhetoric took on a harsher tone under the new government. After the March 2016 terrorist attacks in Brussels, Prime Minister Beata Szydło announced that Poland would not accept any refugees under the plan. “I say very clearly that I see no possibility at this time of immigrants coming to Poland,” Szydło said. This rightward shift is particularly momentous because Poland sees itself as the leader of East Central Europe, and now seems to be turning away from the “Weimar Triangle” (Poland, France, and Germany) and back towards the Visegrád Group. The change in the country’s political alignments furthers the region’s tendency to close borders and refuse to accept refugees, a trend that threatens European solidarity in this area. It is critical, therefore, to understand the factors behind the policy changes and harsh reaction to refugees seen in Poland and other East Central European countries. The week before the EU quota plan vote, thousands of Poles marched in cities across the country chanting “Today refugees, tomorrow terrorists!” and “Poland, free of Islam!” Many observers have portrayed this Islamophobia, demonstrated at far-right protests and in online forums, as an “Eastern European” problem. Yet while the media have tended to ascribe these antimigrant attitudes to either racism or economic concerns, the picture is much more nuanced. The calculations behind the Polish political rhetoric that has stoked increasingly harsh, and at times xenophobic, public opinion are part of a much larger European trend of anti-EU and anti-immigration sentiment. For most of the 20th century, Poland was a sending country of both refugees and immigrants. Faced with a lagging economy and the destruction of war, more than 1 million Polish migrants left for greater prosperity in Western Europe and the United States. Like many Eastern Bloc countries in the postwar period, the Polish government maintained an isolationist approach to migration policy, strictly controlling both emigration and immigration, and largely limiting asylum to nationals of other countries experiencing “class struggle” (such as Vietnam). In the 1990s, these policies began to change. As Poland liberalized its economy and sought to align itself with Western Europe, the government created an asylum regime in line with international standards and the 1951 Refugee Convention. Individuals from the former Soviet Union, Somalia, Afghanistan, and other countries began to seek asylum in Poland, and the government adopted an especially generous stance towards Bosnians and Chechens. The biggest change in Poland’s migration profile came with Polish accession to the European Union in 2004, and the freedom of mobility that such membership entailed. Within two years of accession, more than 264,000 Poles had been approved for work applications in the United Kingdom alone. As of 2015, an estimated 1.3 million to 2 million Poles resided in other Member States. The contrast between Poles’ willingness to utilize EU free movement provisions to their advantage, primarily through labor migration, and their recent unwillingness to share the burden of refugees arriving in Europe has led other EU countries to accuse Poland of hypocrisy. Critics have also argued that, as a country with a long history of forced migration, Poland ought to be more sympathetic to refugees’ plight. Polish leaders have largely dismissed such charges, instead claiming that most of those entering the European Union from the Middle East and North Africa are economic migrants and that Poland must do what is in its best interest. Some commentators have claimed that the lack of experience receiving refugees and immigrants predisposes countries such as Poland to intolerance and even xenophobia. Polling data belies this presumption, however. Perhaps due to the high levels of emigration from Poland to other EU countries, the Polish public typically held very high opinions of migration throughout the 2000s (see Figure 1). Note: The scale is 0 (for Worse) and 10 (Better). Source: European Social Survey, “Data and Documentation – Various Years,” accessed June 15, 2015, available online. Data from the European Social Survey between 2002 and 2012 show that Poles consistently held some of the most pro-immigration views in Europe, expressing similar views towards refugees and asylum seekers. In the 2014 European Social Survey, 63.4 percent of Poles agreed or strongly agreed that their government “should be generous judging applications for refugee status”—a more positive response than voiced by Swedes (60.3 percent) and Germans (38.8 percent). These data are corroborated by the German Marshall Fund’s 2014 Transatlantic Trends report, in which 42 percent of Poles said that their country’s asylum policy was “about right” and 24 percent said that they were willing to have a less restrictive policy. Poland also showed a relatively tolerant attitude towards immigrants. The World Values Survey, conducted in Poland in 2012, found that Poles were not particularly averse to having immigrants or people of different races as neighbors (see Figure 2). Poles may not have ranked as accepting as Swedes in this sense, but their responses were strikingly more tolerant than those of Germans, whose country became the poster child for accepting Syrian refugees and asylum seekers following the massive influx of arrivals that began in 2015. Source: World Values Survey, “Wave 6 (2010-2014),” accessed June 15, 2016, available online. When asked specifically about Muslims, the Polish response was not always as welcoming. In the 2014 European Social Survey, 34.3 percent of Poles said that no Muslims should be allowed to come to Poland. This level of Islamophobia stands in stark contrast to the relatively tolerant views on diversity, noted in Figure 2, and may stem from the historically strong religious component of Poland’s national identity. The Muslim community in Poland numbers only about 20,000 to 40,000 (0.1 percent of the population), and the Polish nation has historically been defined by its strong Catholic majority. However, the issue of immigration should not solely be defined through religion. Slightly more than 43 percent of Poles voiced the belief that immigrants took more jobs than they created, a much higher proportion than German or Swedish respondents. Though Poland has a low birth rate, the country has not constructed a narrative similar to the one seen in Germany, where immigration is viewed as a remedy for demographic decline and a driver of continued economic growth. Poles may also be unsympathetic to the cause of EU burden-sharing as their economy lags far behind those of Western Europe—in 2014, Poland’s GDP per capita stood at 68 percent of the EU average. 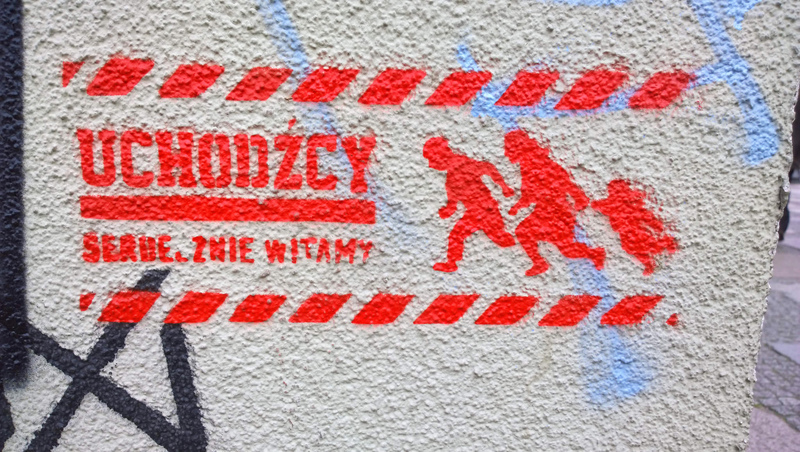 Turning to the migration and asylum crisis that began in earnest in mid-2015 and the Polish aversion to accepting a share of humanitarian arrivals, an evolution in Polish attitudes can be discerned. An analysis of data collected by the Polish Public Opinion Research Center in 2015 and early 2016 provides two immediate conclusions. First, Poles are much less accepting of refugees from the Middle East and Africa than those from Ukraine (see Figure 3). In April 2016, just 25 percent of Poles thought that the country should take refugees from the Middle East and Africa, while 60 percent were prepared to accept Ukrainians. Source: Centrum Badania Opinii Społeznej [Polish Public Opinion Research Center], O kryzysie migracyjnym po zamachach w Brukseli. 69 (Warsaw: Centrum Badania Opinii Społeznej, 2016), available online. Additionally, public attitudes in Poland towards Ukrainian refugees have remained much more consistent. In September 2015, the month in which policymakers voted on the EU quota plan, Polish acceptance of Middle Eastern refugees peaked at 46 percent. While this support decreased slightly in October, a large drop was seen in the polling data two months later: from 43 percent to 30 percent in December. This intermediate period is clearly significant and included two notable events: the Polish parliamentary elections on October 25 and the Paris terror attacks on November 13. Security fears due to concerns about crime and terrorism. While these drivers of public anxiety are not unique to Poland or to East Central Europe, the case of antirefugee sentiment in Poland clearly demonstrates how these factors can overlap and intersect. An individual’s views often pull together multiple drivers of sentiment against immigration, and the weight carried by each may shift with current events and changing public or political narratives. A reading of Polish social media commentary also shows how these drivers combine to guide individual opinion. Some Poles pointed to the perceived wealth of arriving asylum seekers, particularly their use of cell phones, as proof of interest only in richer, West European states that have strong social welfare systems. Other migration skeptics referenced their firsthand experiences in countries such as Germany and the observed lack of integration of Muslim immigrants, implying that Western Europe is seeking to “export” the challenges of multiculturalism to Poland. This took on new importance after the Paris attacks, where the distance between Islam and Christianity took on renewed security dimensions. This episode demonstrates the sway politicians’ statements hold over public perceptions of the refugee and migration crisis. As the number of arrivals increased and tensions escalated across Europe, Poland was locked in a domestic political battle between the ruling pro-European Civic Platform Party and the nationalist Law and Justice Party. Law and Justice’s populist, anti-establishment message linked many of the common elements of public anxiety described above together, including the failures of the free market consensus, EU overreach, and uncertainty about government management of the crisis. This contrast can be seen in the parties’ rhetoric during the final months of 2015—a period that spans the drop in Polish support for Middle Eastern and African refugees noted above. On September 14, Prime Minister Kopacz spoke ahead of an EU summit on the refugee crisis, saying, “We will accept as many refugees as we can afford, not one more, not one less. I promise the Polish people that we will not show ourselves to be the black sheep of Europe, but we also will not allow that our interests in any way be compromised.” Kopacz’s message was clear: while Poland must look after its self-interest, European norms and solidarity must also be heeded. Kopacz’s eventual acceptance of the EU quota plan and perceived unwillingness by Civic Platform to stand up for Poland against Europe, allowed Law and Justice to capitalize on public concern over accepting refugees. After Law and Justice came to power in the October 2015 elections, the new Minister of Foreign Affairs, Witold Waszczykowski, gave an interview in which he was asked about calls for Poland to show solidarity in the face of the crisis. He responded, “You have to remind [the Western European critics] that for every euro we take from the EU, 80 cents goes back to Western Europe.” This is a clear demonstration of how the new Law and Justice government used economic reasoning and anti-EU sentiment to justify its refusal to accept responsibility for the protection of refugees. Many different concerns—such as security, Catholic identity, and European economic disparities—guide the Polish public’s declining support for refugees, particularly those from the Middle East and Africa. For policymakers, civil-society groups, and other stakeholders who seek to restore public support for immigration, it is crucial to recognize that the driving forces behind anti-immigrant sentiment in Poland—while influenced by the country’s history with migration and other domestic factors—are hardly unique. The amalgamation of anti-EU sentiment, economic concerns, and pandering to the majority identity has been seen across the European continent, most recently in the May 2016 near-success of the Freedom Party of Austria, whose candidate would have been the first far-right head of state elected in postwar Europe. This is not a “Polish” or “Eastern European” problem, but a European one. Consequently, more work must be done to promote intercultural dialogue between Muslims and other members of the communities in which they live. At the moment, efforts to improve Polish-Muslim relations have been limited to symbolic events, such as President Andrzej Duda’s visit to a Tatar mosque in September 2015 and an initiative in Warsaw that brought 1,000 Poles to visit a newly constructed mosque that had been the target of protests earlier in the year. Some cities and politicians though have begun making meaningful efforts to improve the situation of Muslim immigrants and refugees in Poland. In Gdańsk, the home of the Solidary movement in the 1980s, Mayor Paweł Adamowicz has worked to make his city more welcoming through conferences, public debates, and meetings between the Migrants’ Support Center (an NGO formed four years ago), the local Muslim League, the police, private landlords, and other community stakeholders. It remains to be seen whether such efforts will result in greater public acceptance of immigrants and refugees. BBC News. 2006. “Nearly 600,000” New EU Migrants. BBC News, August 22, 2006. Available Online. Cienski, Jan. 2016. Poland Slams Door on Refugees. Politico, March 23, 2016. Available Online. Centrum Badania Opinii Społeznej. 2015. O uchodźcach w przededniu unijnego szczytu poświęconego kryzysowi imigracyjnemu, 133. Warsaw: Centrum Badania Opinii Społeznej. Available Online. ---. 2015. Polacy o uchodźcach—w internecie i w “realu,” 149. Warsaw: Centrum Badania Opinii Społeznej. Available Online. ---. 2016. Stosunek Polaków do przyjmowania uchodźców, 12. Warsaw: Centrum Badania Opinii Społeznej. Available Online. Chancellery of the Prime Minister. 2015. Ewa Kopacz: We Will Admit as Many Refugees as We Can Afford. September 14, 2015. Available Online. Chlebny, Jacek and Wojciech Trojan. 2000. The Refugee Status Determination Procedure in Poland. Journal of Refugee Law 12 (2): 212–34. Czarnecki, Maciej and Agata Kondzińska. 2015. Waszczykowski: Uchodźcy Nie Przyjadą. Gazeta Wyborcza, November 11, 2015. Available Online. Deutsche Welle. 2015. Toddler Dies of Measles in Germany as Outbreak Fears Grow. Deutsche Welle, February 23, 2015. Available Online. ---. 2016. Poland Abandons Promise to Take in Refugees after Brussels Attacks. Deutsche Welle, March 23, 2016. Available Online. European Commission. 2015. Refugee Crisis: European Commission Takes Decisive Action. Press release, September 9, 2015. Available Online. European Social Survey. N.d. Data and Documentation – Various Years. Accessed June 15, 2015. Available Online. Eurostat. N.d. GDP per Capita in PPS. Accessed June 15, 2015. Available Online. Gander, Kashmira. 2015. “Today Refugees, Tomorrow Terrorists”: Eastern Europeans Chant Anti-Islam Slogans in Demonstrations Against Refugees. The Independent, September 13, 2015. Available Online. Gera, Vanessa. 2015. Right-Wing Polish Leader: Migrants Carry Diseases to Europe. Associated Press, October 14, 2015. Available Online. German Marshall Fund of the United States (GMFUS). 2014. Transatlantic Trends: Mobility, Migration and Integration. Washington, DC: GMFUS. Available Online. ---. 2014. Transatlantic Trends: Mobility, Migration and Integration (Key Findings from 2014 and Selected Highlights from Transatlantic Trends and Transatlantic Trends: Immigration 2008-13). Washington, DC: GMFUS. Available Online. Iglicka, Krystyna and Magdalena Ziolek-Skrzypczak. 2010. EU Membership Highlights Poland’s Migration Challenges. Migration Information Source, September 1, 2010. Available Online. Lyman, Rick. 2015. Eastern Bloc’s Resistance to Refugees Highlights Europe’s Cultural and Political Divisions. New York Times, September 12, 2015. Available Online. ---. 2015. Opposition to Refugee Quotas Softens in Europe’s Old Communist Bloc. New York Times, September 23, 2015. Available Online. Malik, Kenan. 2015. Is Eastern Europe Really More Racist Than the West? New York Times, November 3, 2015. Available Online. Mulhall, Thomas. 2015. Poland: Immigration or Stagnation. New Eastern Europe commentary, August 10, 2015. Available Online. Papademetriou, Demetrios G. 2012. Rethinking National Identity in the Age of Migration. Washington, DC: Migration Policy Institute. Available Online. Pędziwiatr, Konrad. 2015. Islamophobia in Poland: National Report 2015. In European Islamophobia Report, eds. Enes Bayrakali and Farid Hafez. Istanbul: Foundation for Political, Economic, and Social Research. Available Online. Radio Poland. 2014. Anti-Islamic Group Patrols Clubs to “Protect” Polish Women. Radio Poland, January 15, 2014. Available Online. Smale, Alison. 2016. Austrian Far-Right Candidate Norbert Hofer Narrowly Loses Presidential Vote. New York Times, May 23, 2016. Available Online. Smith, Alex Duval. 2016. Poles Apart: Gdansk Divided as City Grapples with Immigration and Identity. The Guardian, April 20, 2016. Available Online. Stainsby, R. A. 1990. Asylum-Seekers in Poland: Catalyst for a New Refugee and Asylum Policy in Europe. International Journal of Refugee Law 2 (4): 636–41. Visegrád Group. 2015. Joint Statement of the Heads of Government of the Visegrad Group Countries. Press release, September 4, 2015. Available Online. World Values Survey. 2014. Wave 6 (2010-2014). Accessed June 15, 2016. Available Online. Bart Bachman is a Research Assistant with MPI's International Program. He holds an MA from the Georgetown University School of Foreign Service.